Hummus plays a large role in the Israeli diet. Wherever you may find yourself eating something, from a picnic at the beach, an end-of-year party or a conference in a smart hotel - there you are sure to find a plate of hummus. There are even restaurants in Israel that ONLY serve hummus and no other kind of food. These restaurants, known as a "hummusia" in Hebrew are very popular and Israelis often argue about which hummusia serves the best hummus. Some people like their hummus with cooked fava beans and/ or boiled chickpea kernels, others insist on a boiled egg in their plate (not me!) and others just want a sprinkling of paprika and a dash of olive oil. Which ever way you like to eat it, hummus is very healthy, very filling and a great vegetarian dish. It is made out mashed chickpeas (garbanzo beans), olive oil and seasoning. 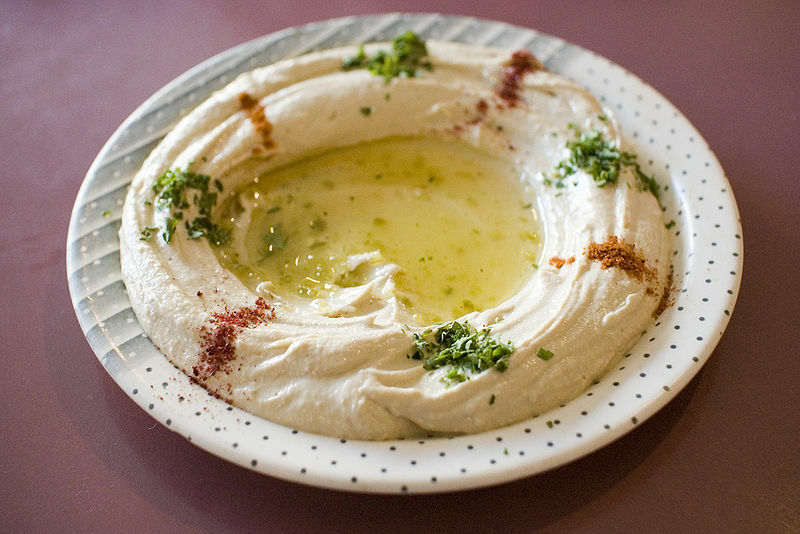 A good plate of hummus MUST be accompanied by a few decent pitot (plural for pita bread). One eats the hummus by breaking of a piece of the pita bread, wiping it in the hummus and then popping it in your mouth.Yummm.... heaven! And for those of you how thinks it sounds a bit messy - yes, you are right! That is why one is supplied with A LOT of napkins. I have read in the newspaper that there are a group of "expert hummus eaters" who calls themselves the Hummus Circle. The members of the Hummus Circle travel around the country (probably in their free time) and rate the various hummus restaurants. Sort of like a Hummus Michelin! I think they keep the results to themselves though because I have never seen any leaflet or anything called "The 10 best Hummusiot in Israel". I may not belong to the Hummus Circle and will probably not travel all around Israel to visit the various hummusiot ( plural for hummusia) but have lived for a while now in Israel and I know a decent hummus when I see...er..taste it. And today I had the luck to eat a decent hummus, a VERY decent hummus as a matter of fact. A friend who works in Yokneam (in the northern part of Israel) has been telling us for a while now about the virtues of Eliyahu's Hummus. So today my family and I went there for lunch (because it is just too hot to cook) and we were pleasantly surprised. This was good hummus! I am sure that the Hummus Circle would give it a rating of 10 out of 10. Or 9 out of 10 if they are a nit-picking crowd. The hummus was great, the pita bread was great, my salad was great, the lemonade was very good and the ambiance was wonderful! Yalla is Hebrew for "move it along/ don't take your time/ forwards". Yes, he is that popular! Eliyahu makes such good hummus that he can tell his customers not to linger! Yokneam has a large industrial park with many hi-tech offices and it looks as if Eliyahu's Hummus is very popular with the hi-tech crowd (judging my fellow table mates). If you ever want to go and eat there, I suggest you go before or after the lunch time rush. So to tell you where in Yokneam you can find Eliyahu's Hummus? Of course I will! It is right behind the Paz gas station on the main road through Yokneam. The place do not look very promising from the outside, but just step inside....and you will walk out a hummus connoisseur! When I would have the chance to go on a tours in jordan, I'll definitely drop by Israel to check out the hummus. How you described it paired with pita bread sounds delectable! Great post. @ Mickey - You should! Hummus is really delicious and healthy. Got a hummus place right across our new house and I can't be more excited to go and grab some. This post had me totally craving for it. @ Janine A hummusia right across from the house! As my kids say: "You luck-bucky!" I would go there every week. I second this whole heartedly. Fell in love with Eliyahu's Hommous after a couple of colleagues took me there on a recent trip to Israel. One of the reasons to go back for me would be Hommous, and Eliyahu specifically. What can I say Arvind - great minds think alike!